How to get a booking: Register online as they need to carry out a security check. Following this vetting you are sent a booking form to complete with all guests’ names and then you place a deposit. 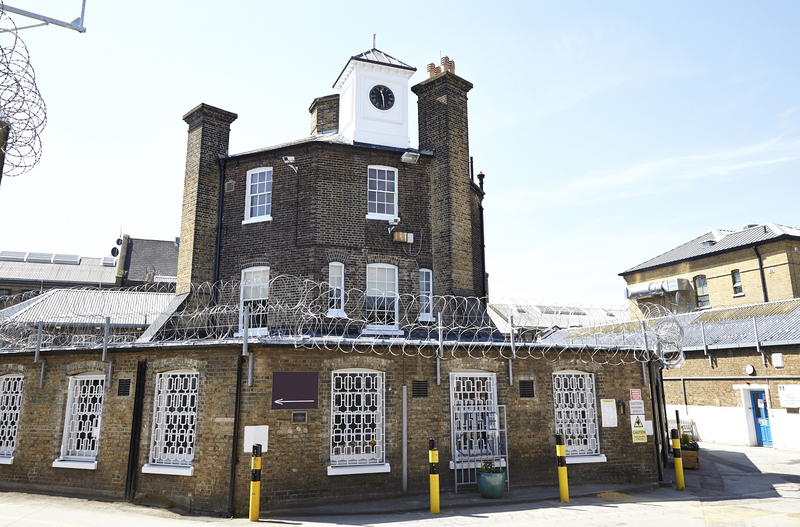 This all takes at least 48 hours so a visit is not a snap decision but the security checks are essential when the restaurant is inside the prison. On the day you walk up the drive alongside the imposing, if not intimidating, outside wall of this Victorian prison and to a booth. Here your identity is checked and you exchange your identity information for a label allowing you into the prison (it all gets returned when you leave). You are not allowed to bring most things into the prison so come with little and definitely not a mobile phone. The restaurant is a round building which can sit 120 people. There are matching glass tables and comfy chairs for two or four and lovely charcoal portraits adorn the walls. The spring menu has a variety of fish and meat dishes as well as veggie options. 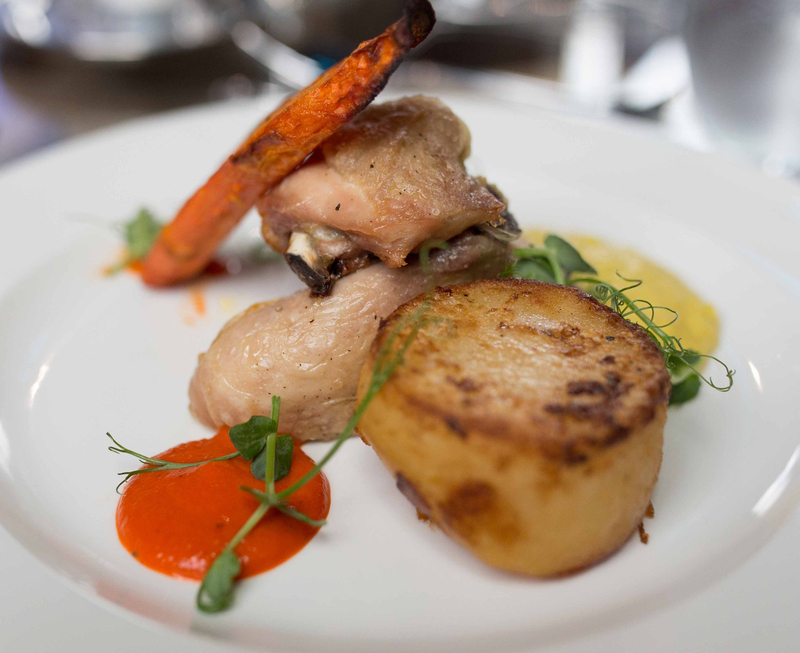 We chose starters of beef carpaccio and poached seat trout and to follow Pan fried, poached and confit chicken and Lamb Wellington. 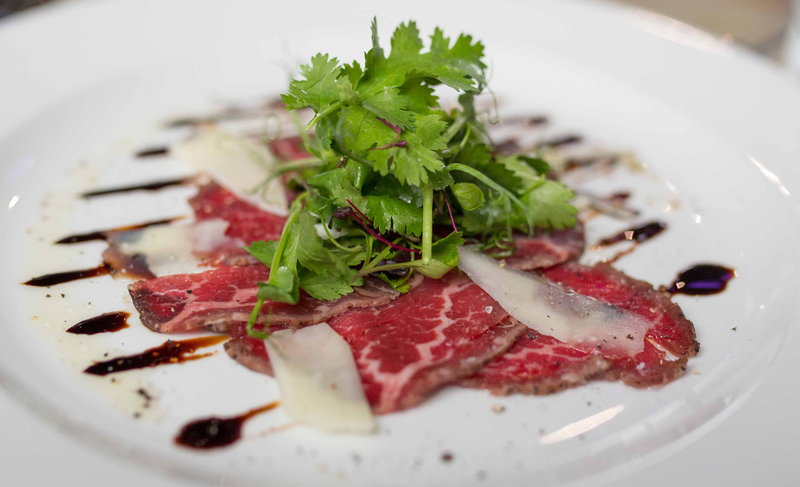 The excellent beef carpaccio comes with fragrant truffle oil and parmesan cheese and a little herb salad. 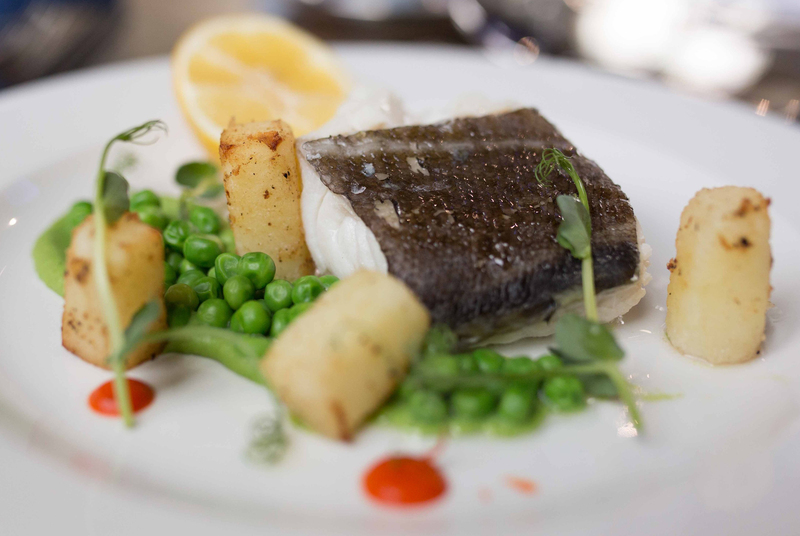 The poached sea trout was soft and the samphire was particularly good – not a single woody bit in the whole lot. It came with cold roast tomatoes and a crème fraiche sauce. The tomatoes could have been a bit more powerful – probably needed slightly slower and longer roasting. 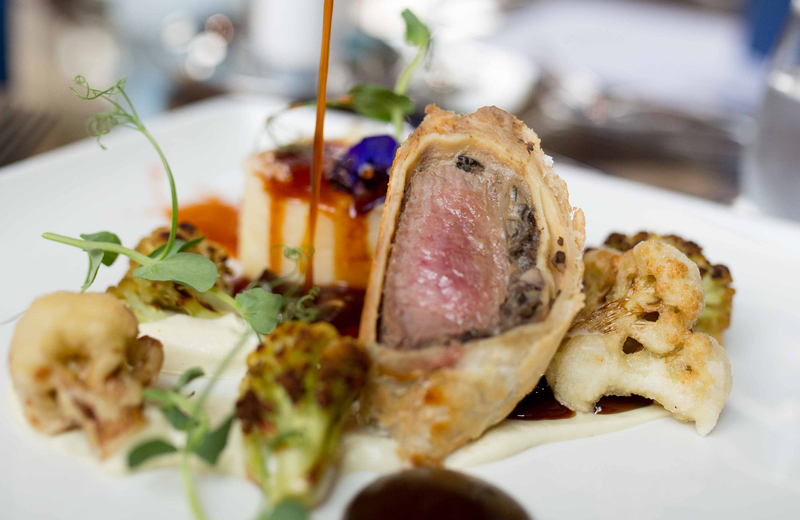 The main courses were really well presented especially the lamb wellington which arrived with a halo of crisp puff pastry which was fantastic – congratulations to the pastry cook. This dish comes with a trio of cauliflower – puree, roasted and boiled. The boiled one could have had a little more salt but that would be nit picking. It was all accompanied by mashed potato and a delicious raisin puree which lifted the lamb which was pink in the middle. I was a bit worried as I ordered this dish because the cutlery is plastic – sturdy but still plastic. I should not have had qualms the lamb was soft and simple to slice. The chicken came with a curried bread sauce and, while tasty, especially the crispy skin, it was a bit dry – more sauce needed. We couldn’t resist a dessert, even though we were pretty full by that stage. We chose rhubarb three ways and the panna cotta. 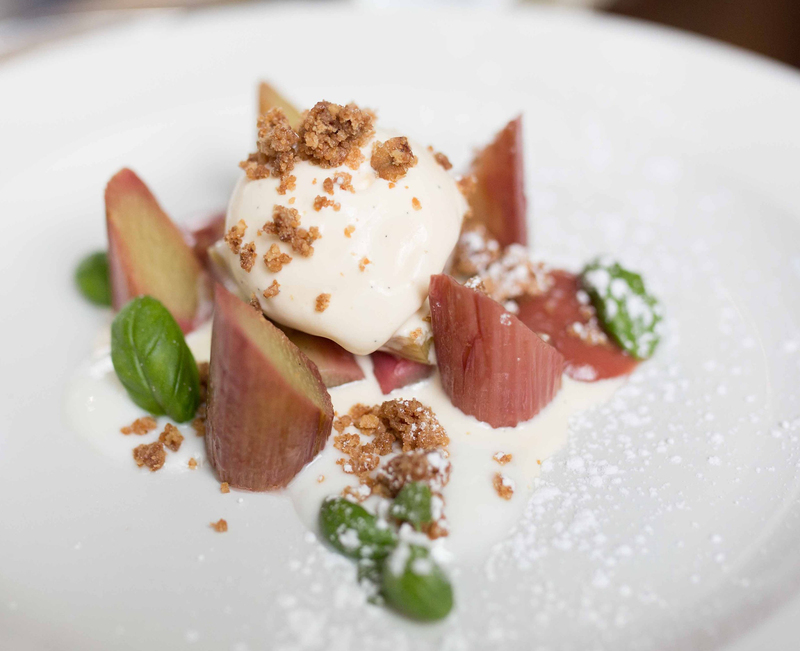 The rhubarb ice cream was lovely and has inspired me to try to reproduce it from our allotment produce this year. It came with spiced rhubarb which was lovely and rich and a hot rhubarb crumble. The panna cotta was flavoured with elderflower, which was subtle and a little overwhelmed by the strawberry coulis. However, it was fresh tasting and a welcome end to the meal. This restaurant has received many hospitality awards. Last year they won prizes for sustainability, the most unusual venue and from the Observer Food Monthly an award for the best Ethical restaurant. People who like to eat well in unusual surroundings knowing that you are contributing to a great educational programme should eat here at least once. Don’t forget your Christmas work lunch – they tell me it’s particularly good value, although, of course, no alcohol is allowed. In terms of service it is friendly and fast. We actually spent a couple of hours but it felt a lot faster – not fast food but definitely with little waiting around. Our waiter was courteous and clearly a little new to the role but learning quickly. London’s hospitality industry is booming so I hope it will absorb these guys as they graduate from a real life experience of working in a restaurant. Without any alcohol but with a couple of non-alcoholic drinks and coffee and tea it was £62.95 for two people. But we really enjoyed it and thought it reasonable value for three courses of good food. Note. You are not allowed to take cameras or phones into the prison so the photographs are those that have been supplied by The Clink. There are were minor differences between the photographs and how the dishes were presented to us but they give a good idea of the quality of the food.